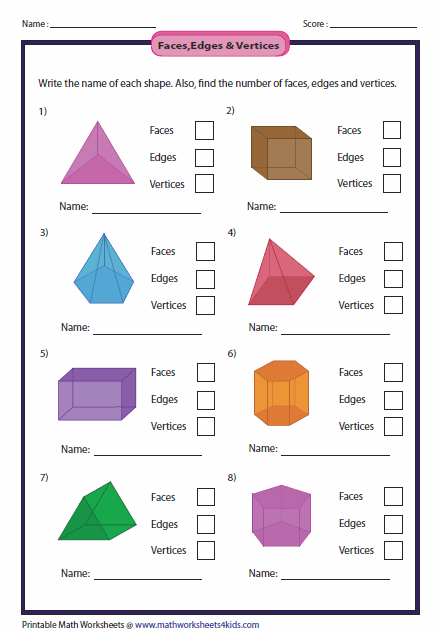 Solid shapes worksheets contain differentiating between 2D and 3D shapes; relating solid shapes and real life objects; labeling (naming) shapes; finding number of faces, edges and vertices; movements like roll, slide and stack; solid nets; printable charts and more. 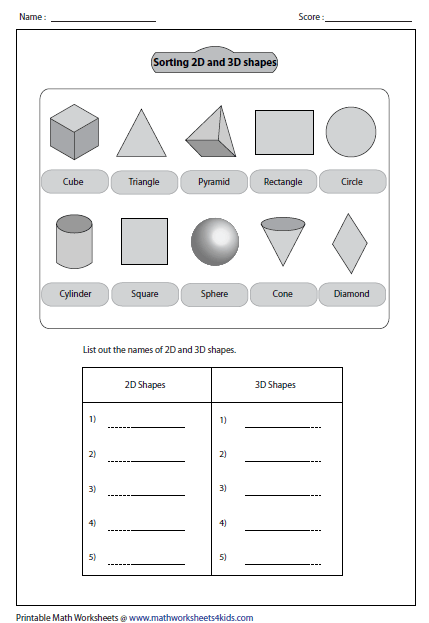 Each worksheet has 8 images identifying 2D or 3D shapes. 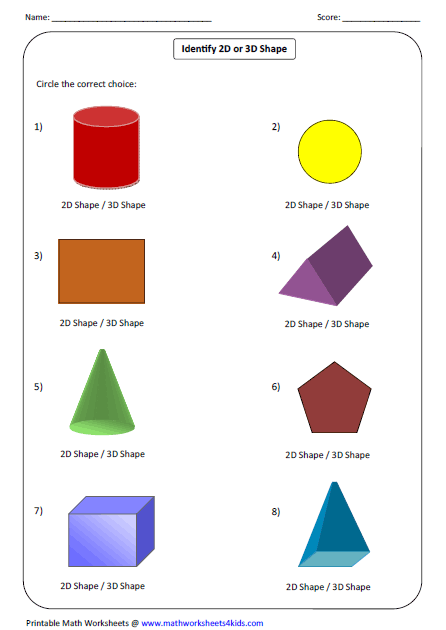 Draw a line from each 2D shape to the related 3D shape. 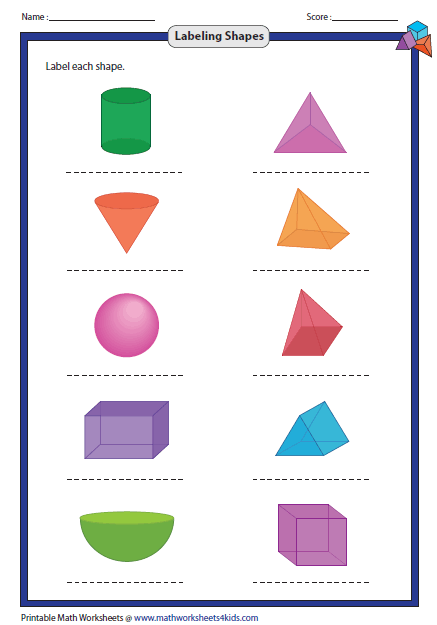 Start sketching 2D shapes in one color and 3D shapes in another color. 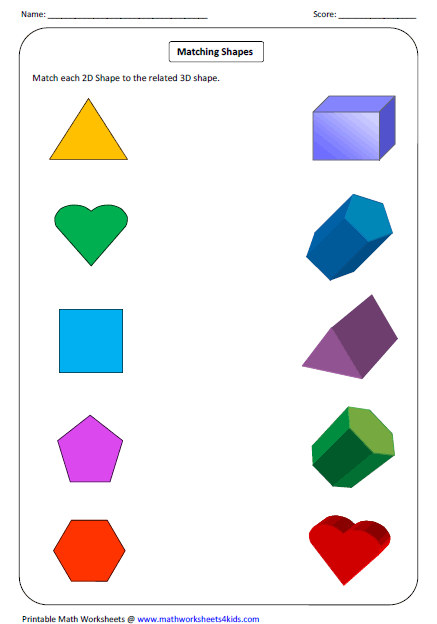 You have collection of shapes with the name under each shape. 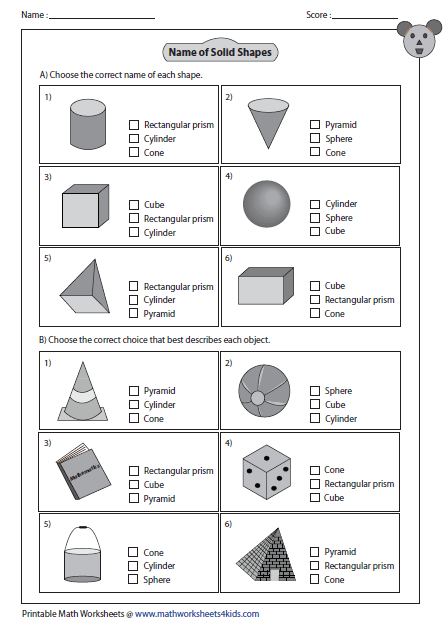 List out the 2D and 3D shapes in tabular column. 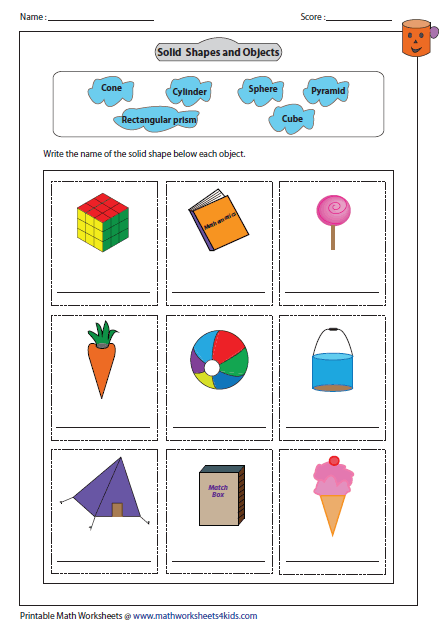 Cut out the graphics, paste it under suitable categories (plane shapes or solid shapes), and write the name of each shape. Cut out the real life objects and glue them under matching shapes. 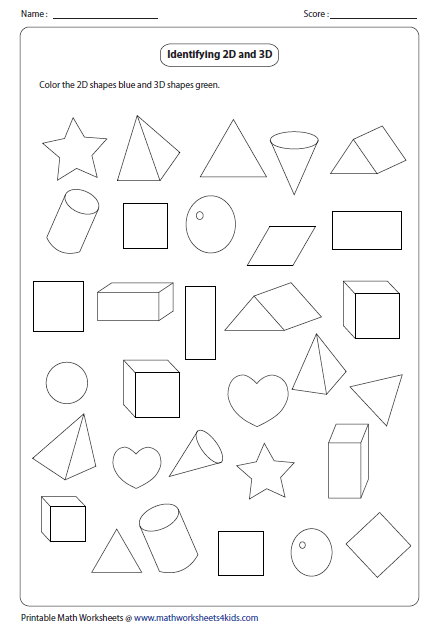 Draw a line to match each 3D shape to the related real life object. 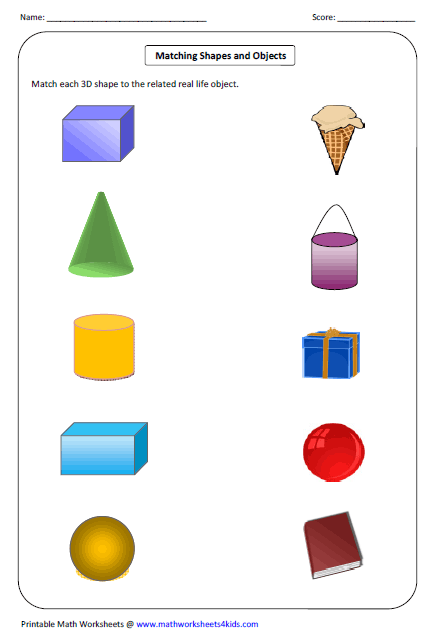 Write the name of the shape of each real life item. 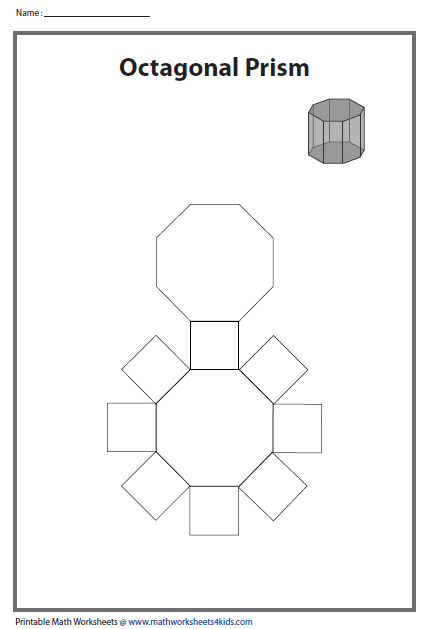 Label each shape and draw any real life object. You have 2 different types to try. Choice the correct choice that best describes each shape or object. 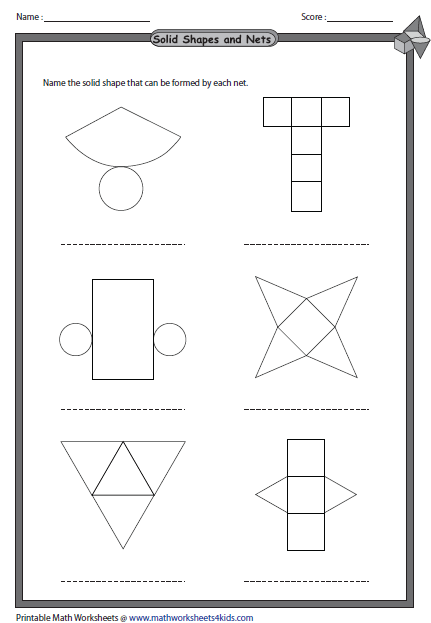 Write the name below each shape. Level 1 is suitable for beginners. 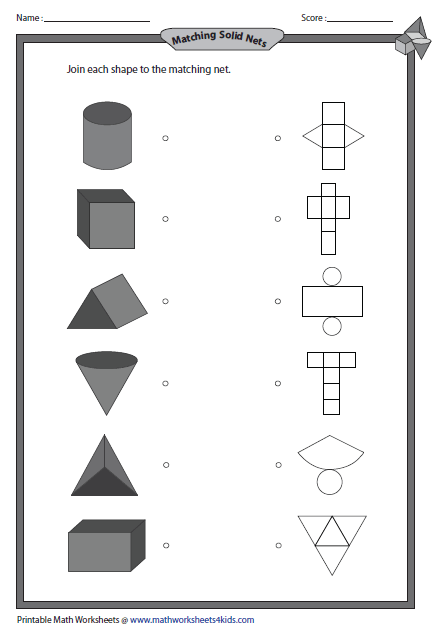 As the level increases, number of shapes in each worksheet increases. 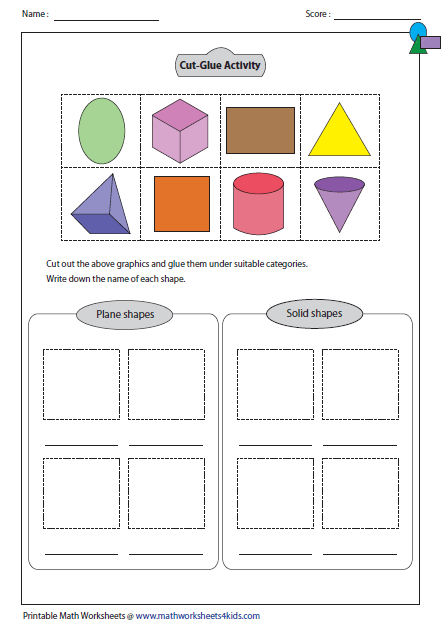 Each worksheet has12 shapes naming prisms and pyramids. 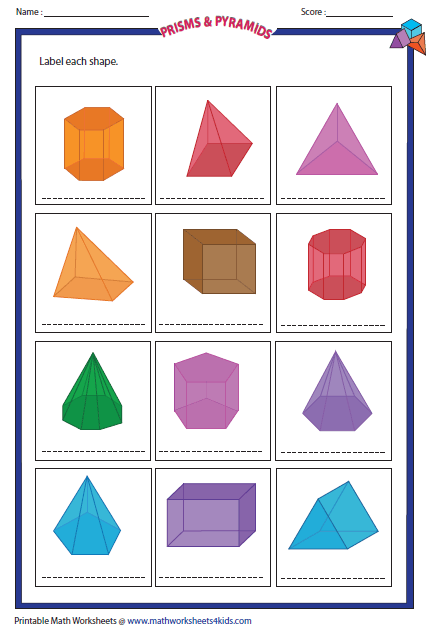 Count the number of faces, edges and vertices of each object and make the correct choice. 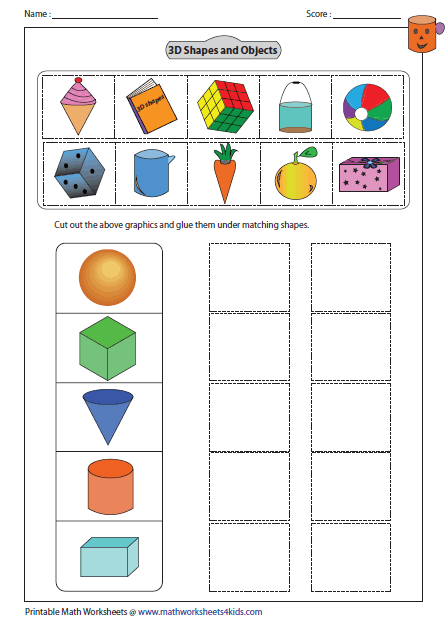 Each worksheet has 8 solid shapes writing name and finding number of faces, edges and vertices. 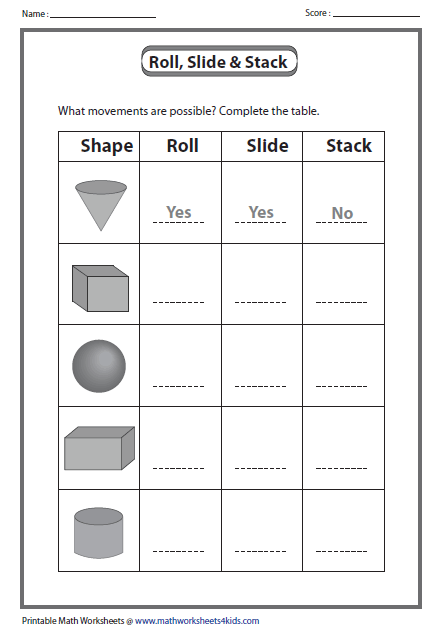 Find out what shape roll, slide and stack. Write 'yes' or 'no' in appropriate places. 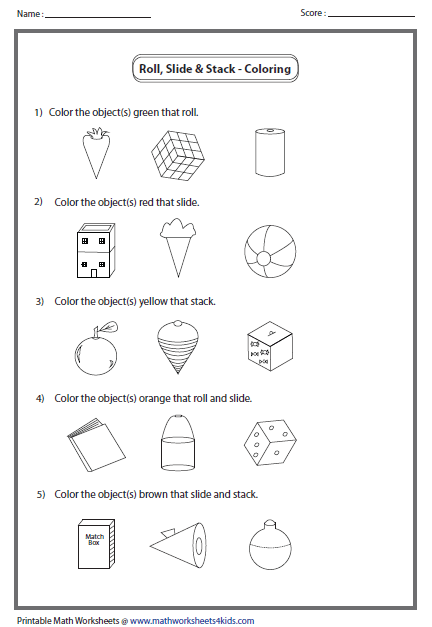 Color the object that roll, slide or stack. 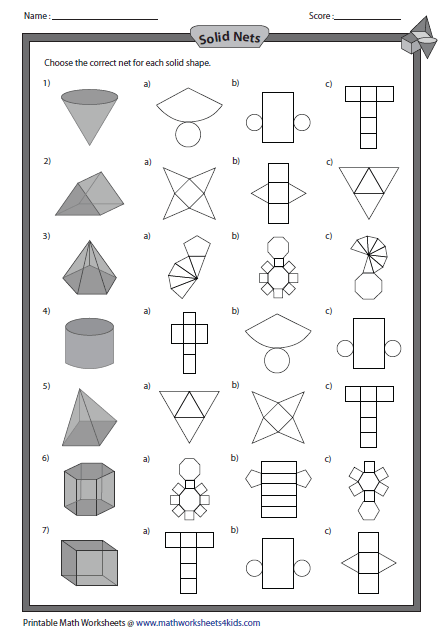 Each worksheet has 6 problems writing name of the shape formed by the net. 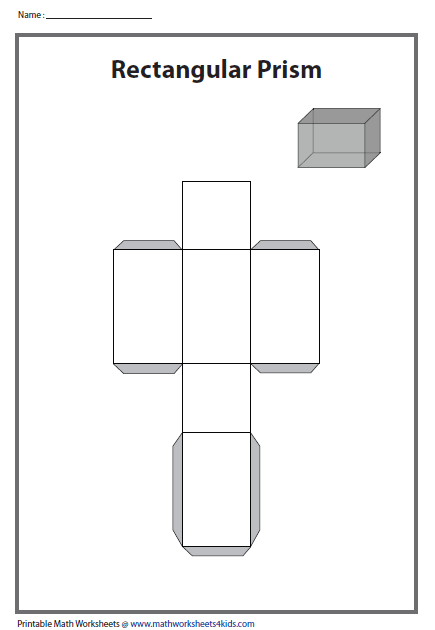 Join each 3D shape from the left to the matching 3D net to the right. 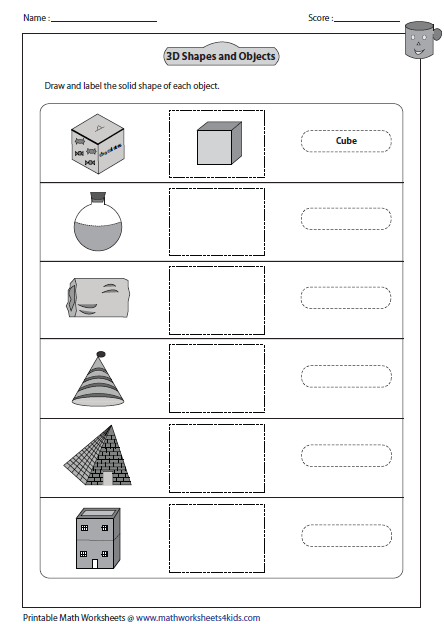 Each worksheet has 7 multiple choice questions finding net for each solid shape. 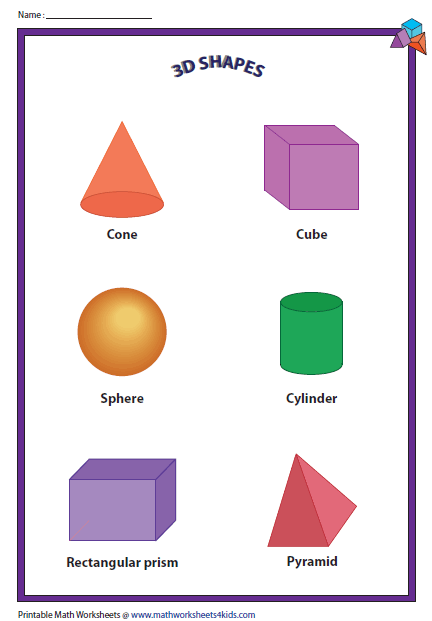 Level 1 has sphere, rectangular prism (cuboid), cube, pyramid, cone and cylinder. As the level increases, sides of base of the prisms and pyramids increases; other shapes like hemi-sphere, ellipsoid and torus included. 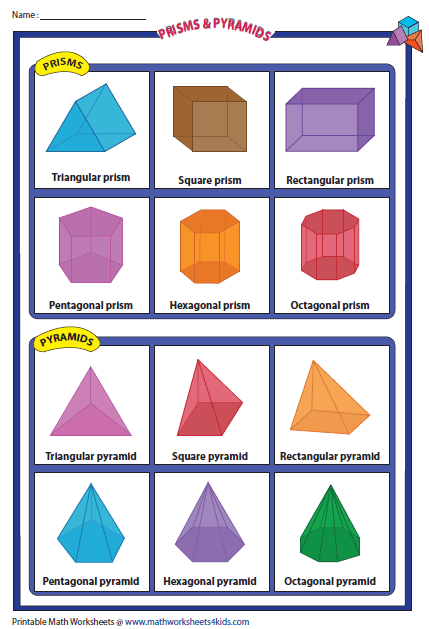 Exclusive charts that include only prisms and pyramids. To create the shape, cut the net along the corners and glue the tabs. 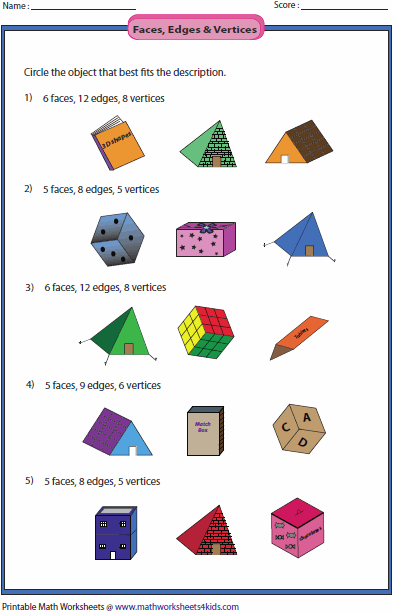 Printable solid nets to teach what shape is possible using the given net.